This was the last day of the Rally. Mavis took a class on convection microwaves and I learned about boondocking. This is about camping in your motor home with no access to power, water or sewer. There were long discussions on solar power, and conserving water. The most unique idea was using a macerator and pump to empty your holding tanks into a bladder located in your towed vehicle. I made one more round of the motorhomes on display and am disappointed that there is no new motorhome that I just really have to get. Tonight the final entertainment was a 20 person big band music team that played and danced. 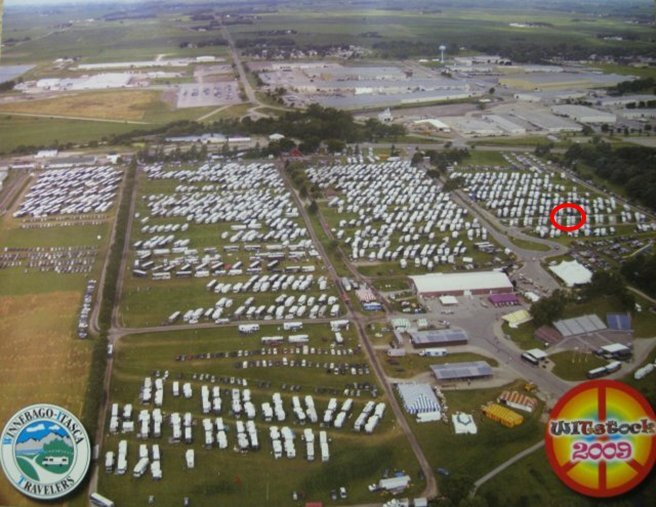 The aerial photo shows the scope of this event with our location highlighted. The Winnebago factories are at the top. The seminar tents, trade show exhibits, food buildings, and amphitheater is in the lower right.